Broccoli is one of those vegetables that is fun to dress up. What is your favourite flavour boost for this bright green vegetable? I had some finely diced carrot and peppers leftover from another meal. 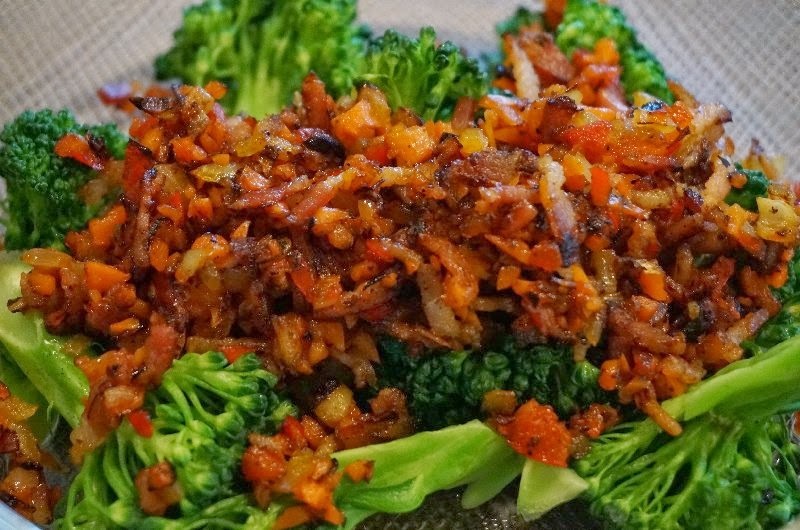 Added to bacon and onions, it made a very tasty topping for broccoli. Fry bacon until it is crisp. Drain off most of the bacon drippings. In about 1 tablespoon of bacon drippings, saute onions, carrots and peppers until they start to brown and caramelize. Add bacon and mix well. Set aside. Steam broccoli or microwave it until it is crisp tender. Toss broccoli with butter if desired and arrange on a serving platter. Spoon the vegetables over the broccoli (I like to spoon them in a strip across the middle of the platter). I have to admit that suateed broccoli in olive oil, sea salt and garlic is my favorite. Yours looks divine too. Bacon makes everything taste better. Ooooo that actually looks fabulous!!! I used to eat a lot of broccoli, and I need to start again... it's so good for you! I seldom buy bacon, but the smell of it cooking is wonderful and I bet it would delicious used in this dish! Bacon has gone up in price, but I would eat this! I have never thought to put a topping on bacon - this would be a good side dish for Easter!